Banana Muffins with Crumb Topping are moist, soft and full of banana flavor with a crunchy delicious topping that puts this banana muffin over the top! You’re going to love every single crumb of this delicious muffin! Muffins, those little bundles of joy that are so easy to make and taste so good with a cup of coffee in the morning. This moist ,soft, tender muffin has a wonderful banana flavor! 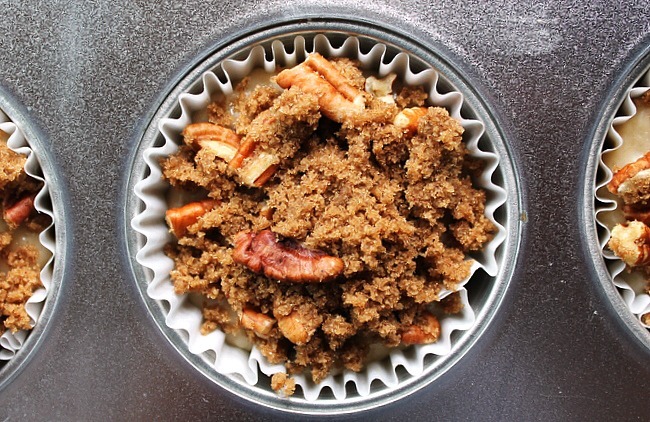 The topping made of brown sugar, butter and pecans complements the banana flavor to a T! Let’s talk about this recipe and muffins in general and how to make them melt in your mouth delicious. As in this recipe and most muffin recipes,you start out by combining the dry ingredients in one bowl and the wet ingredients in another bowl. Then combining the two right before you bake them. Combine the two bowls of ingredients by either stirring or folding them together until they are just incorporated. “Mix until just incorporated”…those instructions come up a lot in scratch baking whether it be muffins or cakes. The reason being …the more you mix, the more gluten is created and the tougher the end result. Muffin batters are normally lumpy, as you can see this one is. It’s ok, they’re suppose to be. After you have mixed your ingredients until just incorporated, fill the paper liners 3/4 full of batter. These muffins have a delicious brown sugar,butter and pecan topping to place on top of the batter. All that’s left is to bake at 375 degrees for 20 minutes and you have the best Banana Muffins with Crumb Topping you have ever eaten! I hope you love them as much as we do! Enjoy! 1. In a large bowl, combine the flour, baking soda,baking powder and salt. Stir with a fork. 2. In a medium size bowl, mix the bananas, white sugar, the slightly beaten egg and melted butter together. Pour this mixture into the large bowl with the flour mixture and stir or fold until just incorporated. 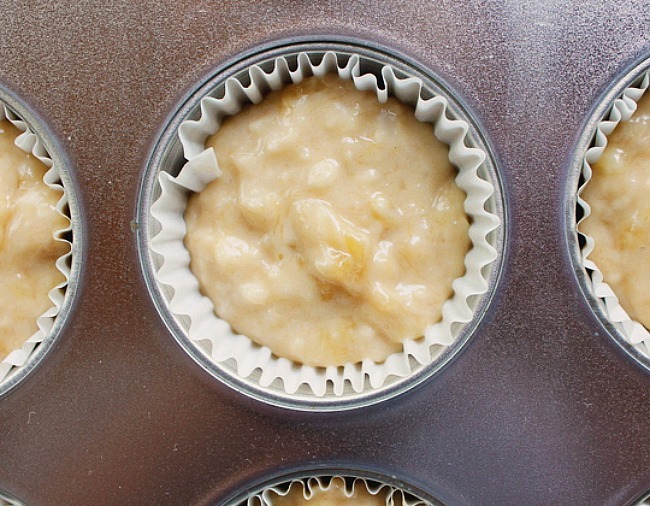 Fill your paper lined muffin cups 3/4 full of batter. 1. In a medium bowl combine the brown sugar,flour,and cinnamon together. Cut the 1 tablespoon of cold butter into the mixture until it's crumbly. Add the chopped pecans and stir. 2. Sprinkle crumb topping on top of muffin batter in pan, bake at 375 degrees for 20 minutes or until tests done with a toothpick. Cool in pan 10 minutes. If you enjoyed this banana recipe, try these delicious recipes from other bloggers. Moist Banana Bread…My New Fav! Those sure look good Mary! These banana muffins are the best that I have ever made! Thanks for the recipe! I can’t believe how moist they are.. Thank you Kathryn, and thank you for taking the time to come back and comment. It’s so helpful to other people who would like to make the recipe. Noe chocolate chips in these muffins would take them to a whole new level! Fantastic idea SD Cook! Oh my these look delicious. I love adding the crumb topping to them. Thank you for linking up with Foodie Friends Friday! You’re welcome Lois! Thanks for the opportunity to share! Mary, these muffins looks and sound absolutely delicious. Thank you Patty! They sure didn’t last long here! I think I may have to let a few of my bananas get overripe. Thanks for sharing this on The Weekend Social. These look amazing and I’m definitely giving this a try. Erlene I eat at least 2 bananas everyday. It was hard for me to let go of 3 of them to over ripe. But i was very happy I did! The muffins are terrific! These look delicious! Thanks for sharing with Foodie Friends Friday! Thank you Michelle! You’re welcome, thank you for the opportunity to share. I will take a baker’s dozen of these, thank you! Thank you Dan, they are delicious! Thank you so much Sharon, thank you for stopping by! Banana muffins are a favorite around here and that crumb topping looks perfect! Thank you Michelle, I hope your family loves them as much as we did! Oh wow, that crumbly, crisp topping is calling my name! Thank you Alisa, and thanks for stopping by! OH I’d love a dozen of these! The tops look to die for. You had me at crumb topping! I hear you Jenny, thanks for stopping by! Thank you LorrieLynn, you just made my day! Just baked a double batch this afternoon. Other than doubling, stayed to the recipe. Response has been very favorable from the tasters. Thank you Dave! I appreciate you coming back to tell me! Hello, Thank you for posting such a mouth-watering recipe!! I have a small question: Do I have to powder the brown sugar? Sorry, if sounds silly. However, I did not get a “crunch”. So, I was wondering if I misunderstood, as I powdered the brown sugar. Kindly clarify. Thank you. Hi Lalita, the crunch would come from the pecans in the topping. I just got done making a double batch of these, that way my husband can take some to the shop where he works. The guys there love when I bake and send things with him!! My house smells amazing… I will get the final verdict when he comes home and tries one. If they taste as good as they look, they will be a huge success! Thanks for that recipe…. I bet they love you to pieces for baking for them girl! How sweet are you! Yes they are absolutely going to love them, thanks to you! Can you use a loaf pan if so how long to bake? Paula I’ve never done that so I would be guessing that yes you could. The baking time? The muffins were baked at 375 degrees, if your making a loaf pan, I’d say 350 to be safe at a baking time of between 25 to 30 minutes. Checking with a toothpick at about the 25 minute mark and then if it comes out sticky, give it more time. I just made these. I didn’t have enough bananas so I added some apple sauce to the batter. They came out great. They look really good. Puffed up nicely, moist with a crunchy top. My husband came home, ate one and commented they are really good! Thanks for the recipe! Your welcome Sue, thank you for coming back to co ment about the recipe, I appreciate it! IS YOUR CALORIE COUNT CORRECT FOR ONE MUFFIN ? YIPES! I know right, it’s good though, really really GOOD! Is your calorie count for ONE muffin correct? YIPES! Hi. Thank you for answering. They DO look good but………….NEVER at this sky high calorie count, if its correct. Do love your blog! It’s been ages since I’ve been visiting blogs. I’m so glad I spotted this recipe. I have been eyeing some bananas that are way ripe– and banana bread isn’t my absolute favorite. However, that topping looks AMAZING so I just printed the recipe and am about to bake them. You make some of the tastiest comfort foods! Our family decided these were some of the best tasting muffins I have ever made. My son keeps asking if I need bananas to make the muffins again. This recipe is definitely a repeater and repeater. Thank you so much. I love this Sherry, your going to be the banana muffin maker now, I love it! These were fantastic and I have kept the recipe in my forever file. The topping had the right amount of sweet to nut ratio and the constancy of the muffin texture was perfect. The notes that I added were to decrease the salt to 1 quarter tsp and to add 1 half tsp vanilla BUT, that is personal preference. Thanks for the recipe and continue to share your love of yumminess!! Wonderful Charlie!! THank you so much for taking the time to come back and comment! I made these for Christmas morning and they were delicious! Thank you for a great recipe to use up those bananas. You are welcome and thank you Darnell! AWE Sweet April!! I love it! Thank you for taking the time to come back and comment April, it’s so helpful to others that would like to make the muffins. I never post on blogs, but I had to come back and review these muffins! They were SO good! My muffins always stick to the line, but these peeled right off. They were also the most DELICIOUS muffins I’ve ever had! I added a little but of oats to the crumble and it was awesome. These muffins were wonderful. So moist and flavorful. The crumb topping pushed them over the top.